I have a not-so-secret crush on outdoor rugs! They can define a space outside and make it an outdoor room. They are so so durable and most importantly (well, maybe not the most important) they are fabulous and pretty! Oh and one more thing… they are often very reasonably priced! Did you know that I not only use them outside and on my porch, but one of my favorite inside rug is really an outdoor rug! YUP! 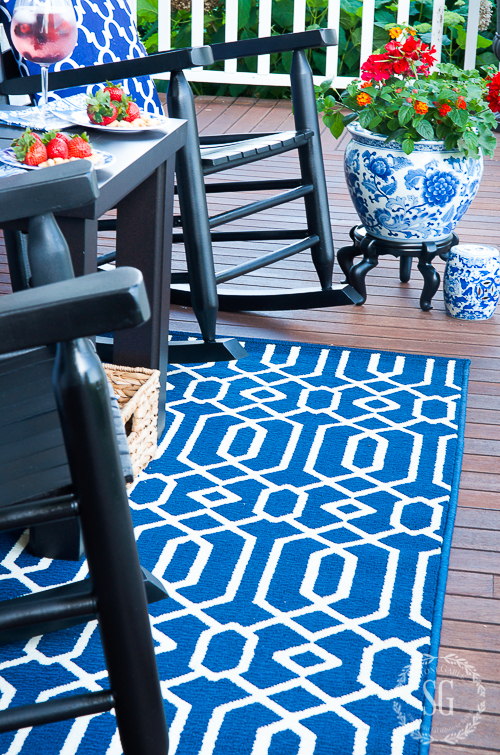 Today we are going to talk about OUTDOOR RUGS! Here are a few tips for choosing and caring for outdoor rugs! To me, this is the most important tip. You have to live with it so you should love it! USE AN OUTDOOR RUG INSIDE! I learned this tip when I had a big party and a little guest spilled orange soda on the oriental rug in the dining room. YIKES! I have a mantra that I live by… PEOPLE ARE MORE IMPORTANT THAN THINGS! So the expensive oriental came out and got cleaned and never went back. 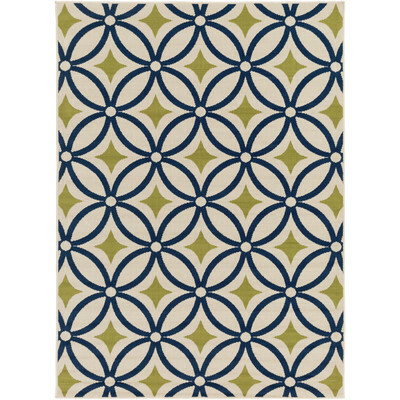 While I was looking for a more economical area rug I came across an outdoor rug I fell in love with. I thought, “why not”? So I ordered it and am so glad I did. It’s my favorite rug! All spills clean up great! I’ve even taken it outside and hosed it down after a big party! If you find an outdoor rug you fall in love with, give it a try inside! 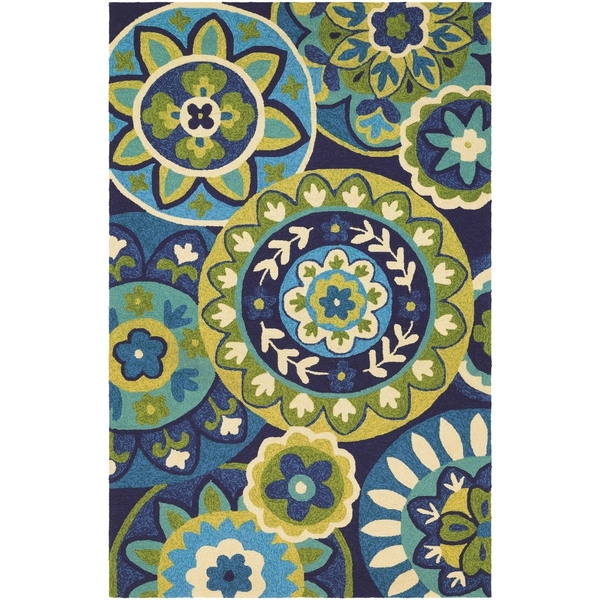 Many outdoor rugs come in wonderful patterns and designs and colors. When choosing an outdoor rug for your home, make sure it works with the rest of your outdoor furniture and cushions! And remember your flooring. You need to consider that in the mix too! If you are thinking about using an outdoor rug under your outdoor dining table make sure it is big enough to pull a chair out from the table without the legs being off the rug. This does not apply to a bistro table or small accent tables. This is an easy one! At least the front legs of the furniture should be on the rug. I must admit, I break this rule with my rocking chairs. Most rugs can and should be cleaned. Follow the care instructions on the back of a rug. Often rugs can be hosed off. If they need cleaning, say at the end of the outdoor season, give them a wash with water, a little dishsoap and a soft scrub brush. Rinse thoroughly. Dry both sides in the sun. Clean up spills and dirt right away. I like to use my leaf blower to blow debris off my rugs. Never leave a rug outdoors all year long if the weather in your area gets snow, ice and freezing temperatures. Clean and totally dry them and roll them up and store them until the weather breaks. Do not ever fold a rug! Make sure to roll it. Here are my top 10 favorite rugs from around the web! I am such a fan of these beauties! I love love love orange accents. What a gorgeous pop of color! And it’s on sale! This rug is amazing! Hand hooked! Who knew? 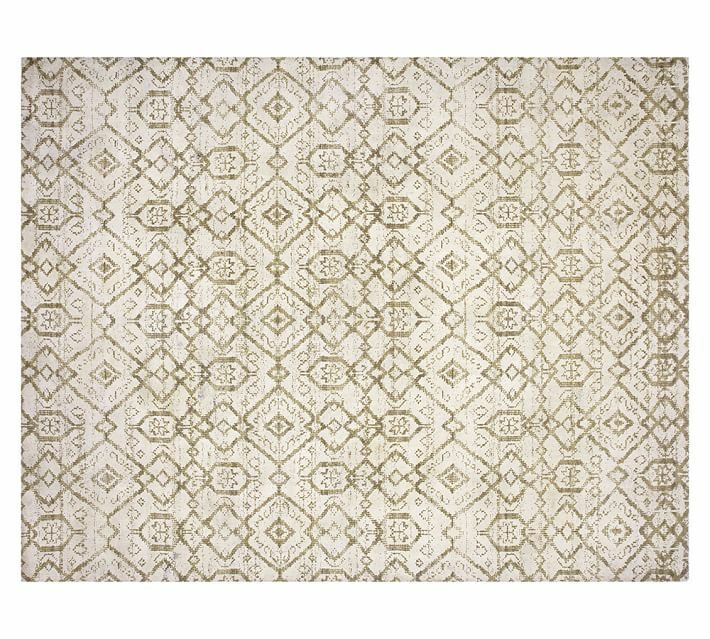 I love love love this rug and would put it in my home! Blue and white have made a resurgence! 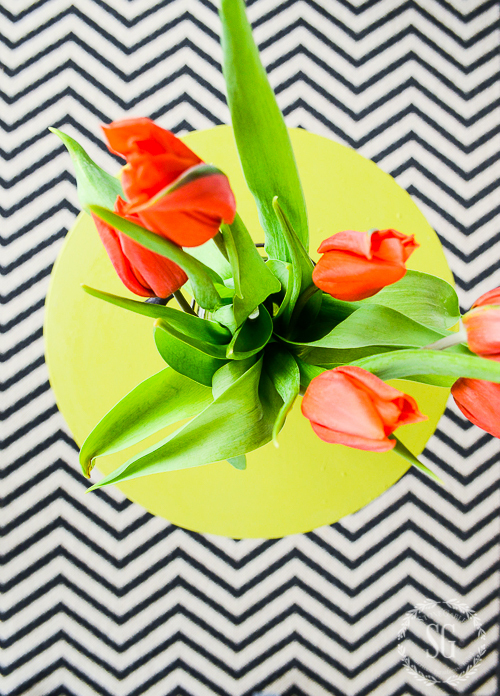 Doesn’t everyone love this color combination? Here’s my dining room rug! LOVE IT!!! A seriously fabulous sunflower! 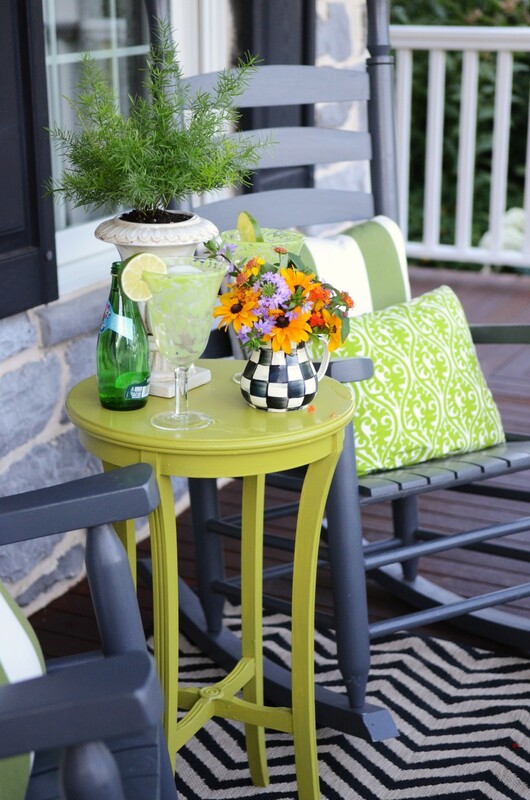 How darling would this look on a patio? How about a natural looking rug? Yes, Please!!!! This rug melts my heart! I have one almost like it in my foyer! 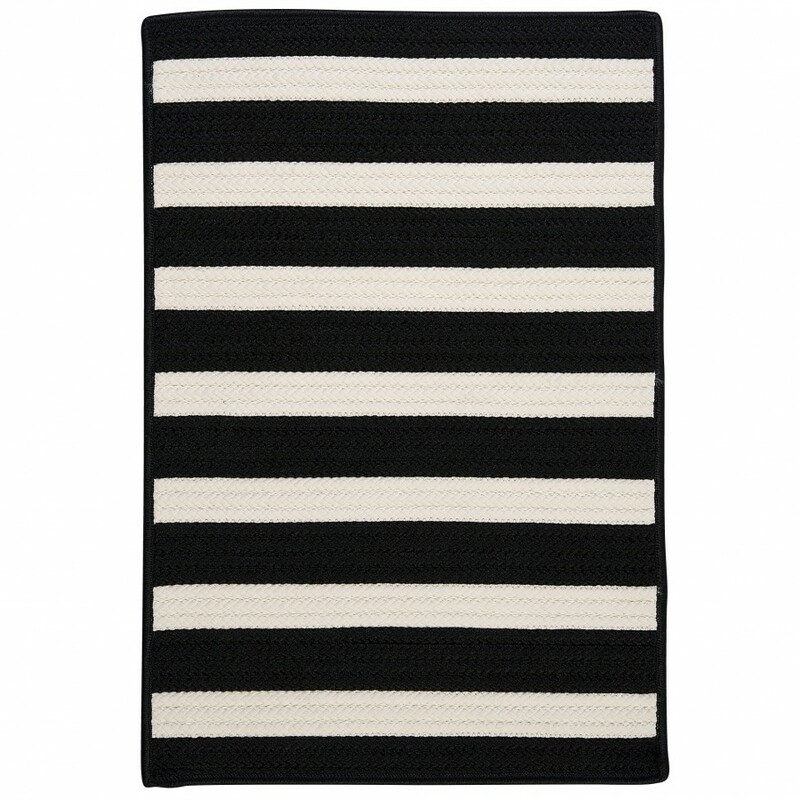 This rug has a nautical feel. Gorgeous colors! Are you crushing over outdoor rugs now? Do you have an outdoor rug at your home and have a tip for us? We would love you to share! You might like to follow me on Pinterest and see what I am finding to pin every day HERE. 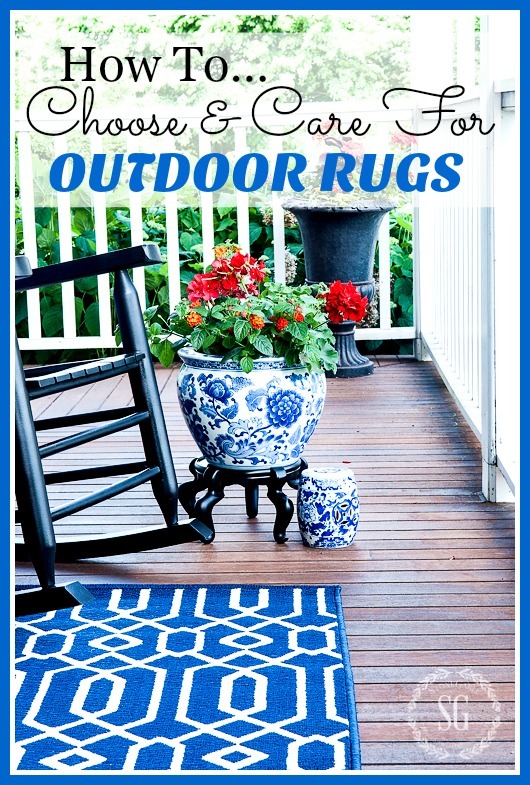 Help me spread the word about outdoor rugs. Please pin! What do you do with the rugs when it rains? Thank you. Great question, Mary! Rain does not hurt these rugs. Thank you for this timely information. I happened to pick up my outdoor rug today. It’s the first time I’ve ever thought about a rug outdoors. I immediately set up my deck with my table and chairs. It feels so much more like a room now. I have a beautiful outdoor rug on my screened porch. When warm weather is over I steam clean it, let it dry thoroughly, roll it up and store it under my bed. Thanks for the wonderful inspiration and the practical how-to’s on rugs. It’s so helpful. Any suggestions on what type of pad to use for an area rug placed on wall to wall carpet? Rug is bunching and rippling. We will replace with hardwoods in the future but trying to add a little texture now. Thanks. Love your blog. The bunching can be caused by a few reasons. The first being that the pile of your wall to wall might be too high. Also, the throw rug might not be stiff enough or it is in a high traffic area. I would not put a rug pad over wall to wall carpeting. Hope this helps. We are just now starting on our outdoor dining area and I have definitely been looking for a rug!! I have bought a wicker dining set and the chairs have an open or wide weave in the wicker. Because the chairs themselves seem to have their own pattern I am afraid of making it all look too ‘busy’. But I don’t want just a solid rug either which would look boring. Would you suggest maybe a large print rug underneath or play it safe with a solid neutral? I appreciate your talent so very much and listen to you and the girls every M/W/F! Not only do I laugh out loud but learn so very much!! Keep up the good work! So glad you are having fun with our Podcast. We sure are too! I’d put a rug with some kind of a design or pattern under your outdoor dining set. It will look more interesting and hide the dirt better. Hope this helps! I have been looking for something to work on my deck with a variety of tables and neutral colors. One of these may work. The two deck areas we did (you inspired) for my son’s house last year are still looking great. Thanks for your post! Out newly built Trex deck was finished and I was ready with my rug and wicker table and chairs, which we left out all summer and it looked perfect! SO happy! This is St Louis- hot -cold – wet -dry.. you name it ! When we took up the rug to wash it – the entire area of covered Trex had a fine green mossy growth on it!! Not good! We had to use a solvent and scrub brush to remove the “patina” that was not welcome! We have found that leaving a rug down in any rain, holds the moisture down … and feeds the green growth! You do not want to do this.We learned it the hard way . Put it down and enjoy.. but take it up often! The rug under my table is amazing! It has no real nap and any stains just wipe right up! Great ideas. In the market right now and your selections were great. Thanks. Gee…how do I choose? – they’re all great! I’m definitely shopping for an outdoor rug for the living room, Thanks for always inspiring me!! Beautiful rug options for in/outdoor use and fun post to read. I am also a fan! After we renovated our kitchen (in the center of our home), the back wall has several major appliances and you have to walk through the kitchen from the garage and dining room to the rest of the house. Finding a long runner for that traffic area wasn’t easy. 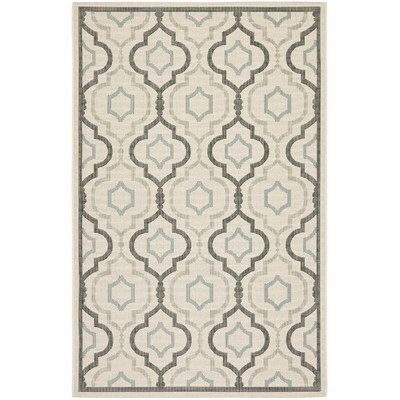 I decided to purchase the Safavieh Anthracite Gray/Beige Indoor/Outdoor Runner Rug (2’2 x 14′) from Overstock (3) years ago. I bought two it was so inexpensive thinking it would wear and look dingy over time. Well, we still have the same original runner in the kitchen and it still looks great! We have a very large family and host all the holidays at our home. It’s the only option! Hi, do you have ordering experience with Wayfair? I see that one has to pay to return and I wondered if that would be very expensive. Thank you! Hi Connie, I have never returned anything from Wayfair, sorry! I’ve been thinking my porch needs a rug. Thanks for the inspiration and ideas! I just tried to order your dining room rug – – I just love it. I’m so disappointed that it is out of stock. I have signed up for notification if it comes back in, but it seems like that never happens for items I really like. I love, love, love your blog. It is one of my absolute favorites. Keep up the good work. A great topic …. Indoor Outdoor rugs…. My favorite by far!! I have used two in/out door runners in my kitchen which is high traffic for 4-5 yrs now and still looks soo spiffy ! I have my husband pressure wash the rugs once a year n they look brand new. Also I have a large rug on the deck under the dining table, which I leave outside yr round..in Georgia! Holds up so nicely!! Thanks so much Yvonne for all the great tops n inspiration?? i love the idea of putting an outdoor rug in the dining room- genius!! Love this! We have 2 dogs and are fortunate to live a mile from our 3 year-old granddaughter, plus we host football watch-parties, so there are always spills and messes. Like you said, people are more important than things so what a great idea to have lovely rugs that clean easily. I love that you show the practical side to having a beautiful home. I have added a bit of blue back in with my neutrals this summer too. I love the rug beneath your dining table. Great tips on cleaning and storage. Your rug choices are all awesome. I especially love your dining room one! Love the black and white rug in your foyer. How classy! I love some of these rugs. I’ve been looking for a while but hadn’t checked online. Love the rugs! I do not own one yet, but as soon as I get the chance I am going to get one, Thanks for the tips about them and caring for them! Thanks Yvonne for this info on outdoor rugs. I love indoor rugs. Must consider outdoor one’s. Although the seasons would be short here in Wisconsin. These are so pretty Yvonne! My favorite one at your home is your dining room rug. I would love to have one just like it, so hopefully I’ll be lucky & win that $100 to help purchase it.? Outdoor carpet for indoors. …an idea I’m going to use! Great idea I’m going to use, outdoor carpet in doors!! I had thought about using one but I was unsure about doing it . Now I see yours I may have to just do it. I have small grandchildren and that’s a good way of keeping it clean! Thanks ! I love my outdoor rugs in my dining room and eat in kitchen. I never have to worry about spills or dirt from the dog. I power wash as needed. 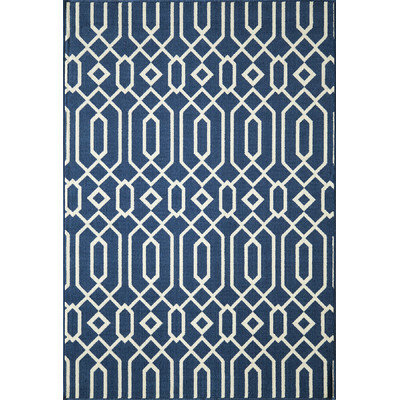 I have a couple of indoor outdoor rugs I got from Ballard and they are fantastic! I have one out on my covered lanai under my dining table and it looks great and has held up so well! It gives the area that finishing touch and makes it more of decorated room. I have another in my laundry room which is also the dog’s room so it gets a lot of drool so it’s important to be able to be cleaned when necessary. 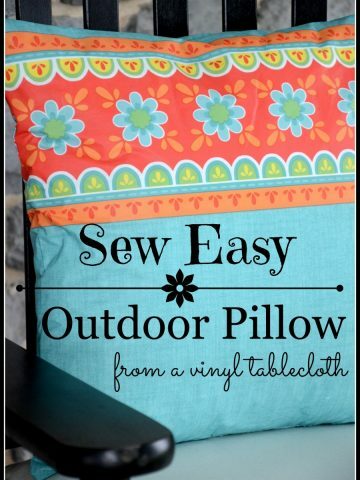 I just pull it out of the laundry, through the garage, lay it out on the driveway and hose it off! It dries in almost an instant (we live in hot and sunny South FL!) and it’s back in place in no time! Love yours in your dining room- Ballard has the same design and I’m thinking of that one for my foyer BEST thing in the house! Never thought of using an outdoor rug inside………good idea especially since so many will be getting put out for clearance. My search for a rug has now expanded! 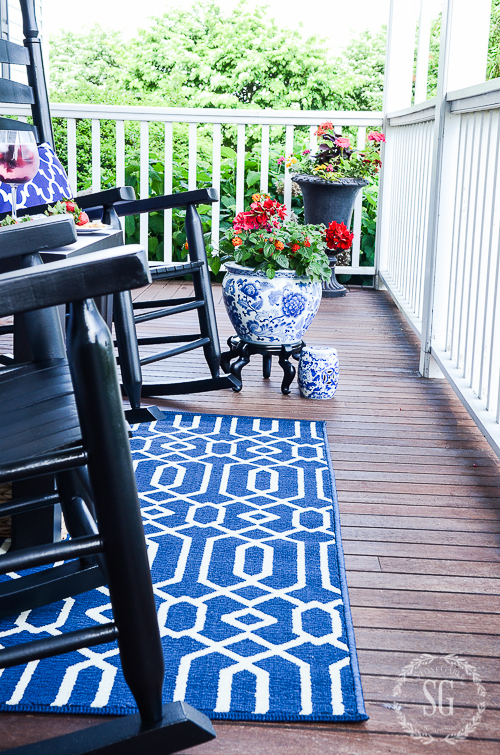 Outdoor area rugs make a porch so very comfortable. I, too, love the blue and white rugs! Thanks for your inspiring blog Yvonne! Pinned two of the rugs, for my dining room. Love the one you are using, and the natural rug. Love the blue rug in the photo of your porch. I agree a rug completes a room..it makes the room pop! Great idea. I have been trying to find a new rug for my kitchen and think this would be a good idea. Thank you for the advice. I have noticed that the prices of outdoor rugs tend to be less pricey compared to indoor rugs. We are getting ready to put wood floors in our house. I will definitely take a look at your links for outdoor rugs for the inside. They are usually much more economical. Yvonne, I took your advice on outdoor rugs earlier this year. Bought the black and sand chevron like yours and have it in a sitting area on my front porch. All I can say is what a difference!! As Autumn is approaching (yay! ), this post is very timely with tips on how to clean and store my rug. Next indoor/outdoor rug will be in the foyer by the front door! 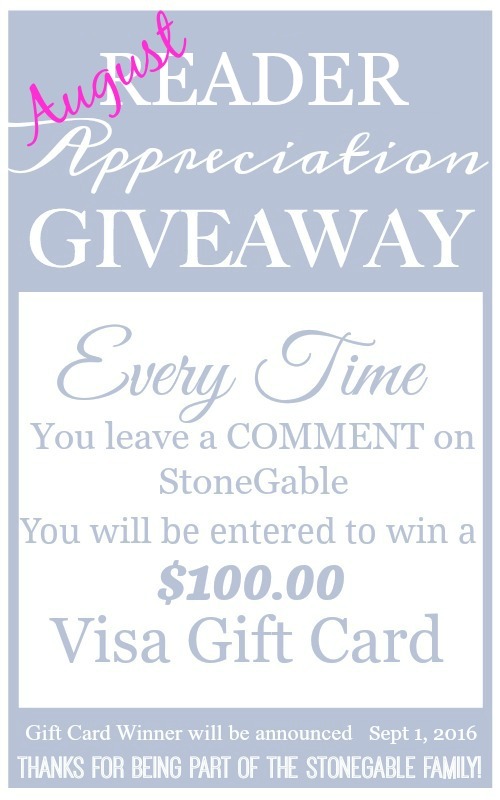 Oh, I’m thrilled you have been inspired by StoneGable! YOU GO GIRL! ahhhh. wonderful inspiration. can’t wait to experiment with rugs outdoors here. we are getting closer to completing the patio and it will be fun experimenting! happy thursday, lovely. Here we go again with great ideas and beautiful rooms. I am like you, I love outdoor rugs. I do a lot of staging and love using them because they are so affordable and make such a statement. The cost of them are so much more reasonable than regular rugs, plus you can clean them yourself. I look forward to your blog everyday to get me started and to read the comments and suggestions that you receive. Could you tell us where you got those rugs? I get a lot of them from Lowe’s and Home Goods (when they have them). Such a great job as usual and enjoy your day. Hi Betty, Above each rug is a link to take you to the rug for sale. I got my blue rug from Ballard, my black and white chevron from overstock.com and the creamy light rug from Birch Lane. I looked for-what-seemed-like-forever for a rug for my new screen porch. Discovered that they may not be indoor/outdoor on the label, but if you look at the care label, and it says “machine wash” or “use mild detergent and a brush”, it will work outdoors. I plan to follow your recommendations re: spills, overall cleaning and winter storage. Your blog today supplied just the added info that I needed! You are my favorite! Thanks for your tip too Debbie! I LOVE your choices!!! Where do you recommend looking for outdoor rugs at the best prices? I would like to buy some more after reading your post!!! 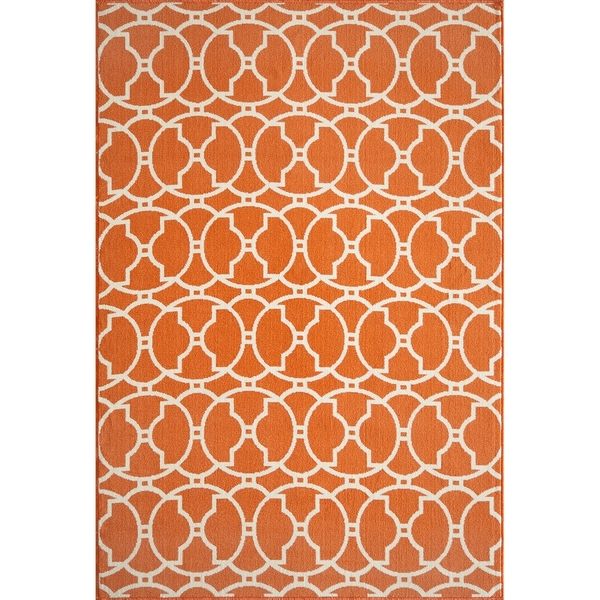 I am shopping right now for an area rug for outdoors, so appreciated the ideas and tips. Thank you. Yvonne, While you have a lovely home that so many of us drool over, I appreciate that you value people over things. When the red wine gets spilled at a dinner party and my guest gets upset with themselves, I let them know that stuff is wood, hay, and stubble while they are eternal and I value them as such. Thank you for your balanced wisdom. So helpful….thank you so much. Thank you for this informative post, Yvonne. I would have a hard time chosing just one of these rugs. I have also used rugs inside my home that were made for the great outdoors. Best floor covering and room “jewelry” I have ever purchased. Compliments galore. Thank you for your”Practically Speaking” post incognito.? You are right! I love PRACTICALLY SPEAKING incognito! Yvonne, Can you just come to my house & tell me which one I need? 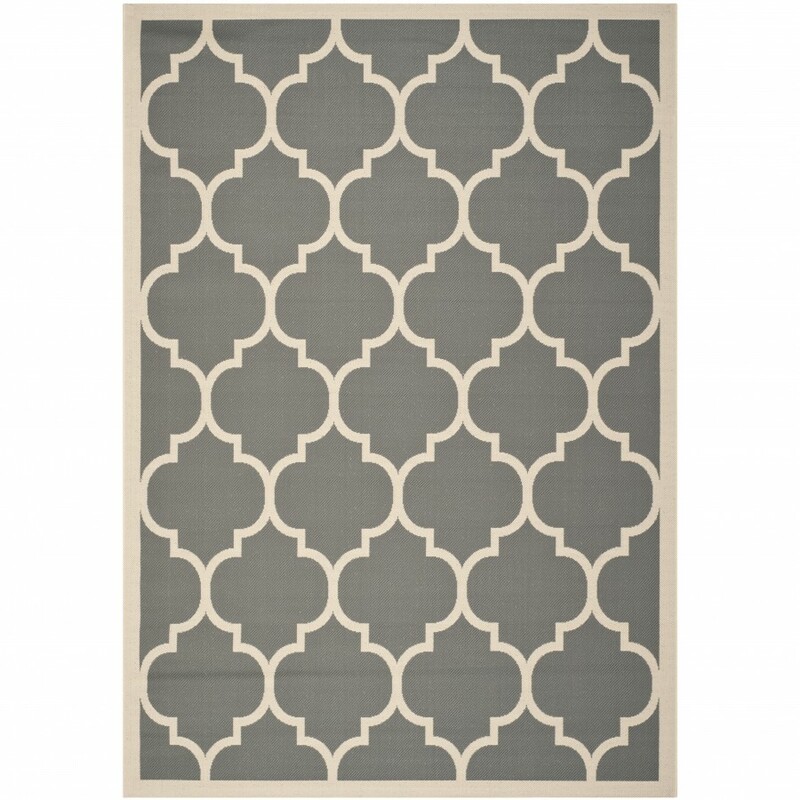 At first glance I would say the SAFAVIEH COURTYARD RUG because I love the way it looks in your house! Love the black & white striped as well!! They were all lovely! You are absolutely right about NOT FOLDING a rug! I bought a pretty rug for my kitchen one time that had previously been folded at the department store. I never got the fold out. I continually tripped over it. Finally got rid of it. Love your dining room rug and would have never guessed it was an outdoor rug. Now I need to do some research! 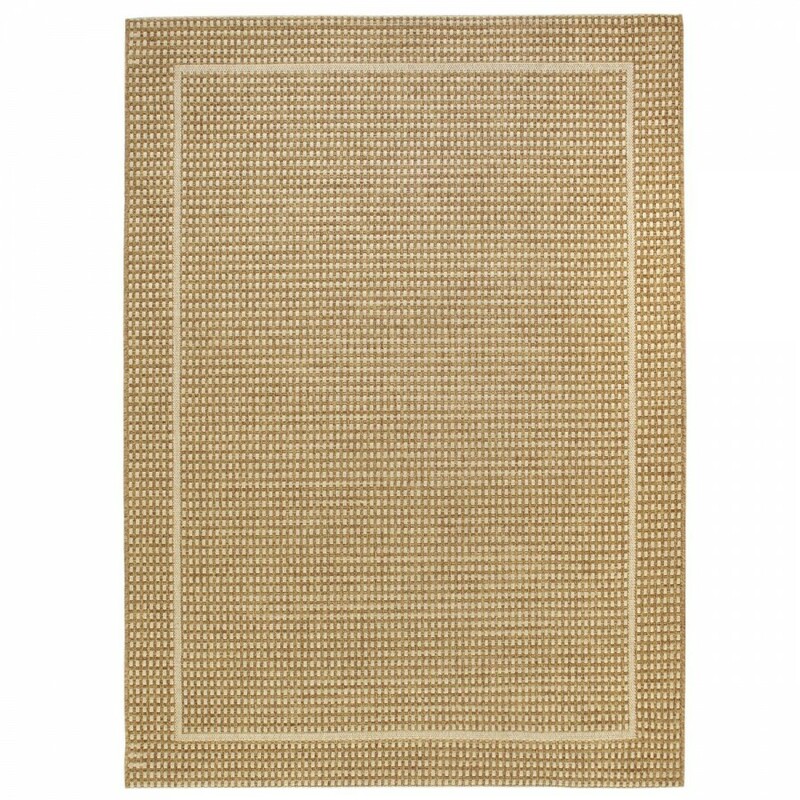 I have been using an outdoor rug from Ballard Designs in my dining room for several years. I have been thinking of getting a new rug and the Dobby Flatweave would be perfect! 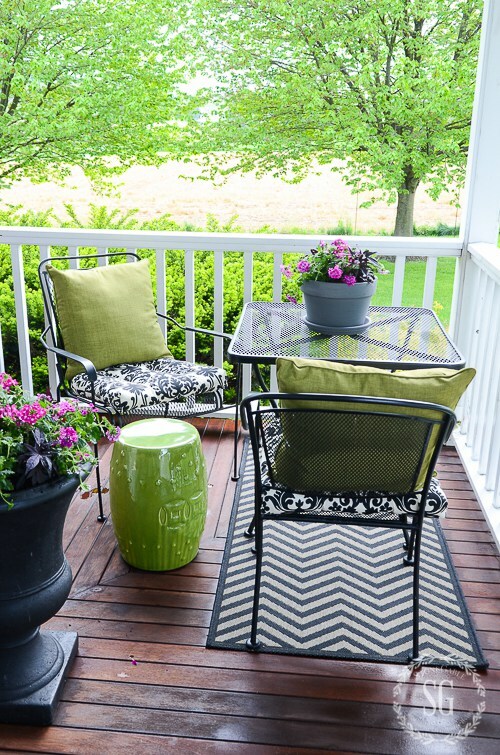 The idea of an outdoor rug is so appealing to me….my only concern is that I have a deck I would put it on and I always worry that the rug over the wood could be a problem. I absolutely love that in our new home (4 yrs. now!!) we have a deck that we can just sit and have dinner on….heaven! But I always feel like it’s dirty…a rug would make is so much better but I don’t want to damage the decking. Just love some of the rugs you’re featuring! 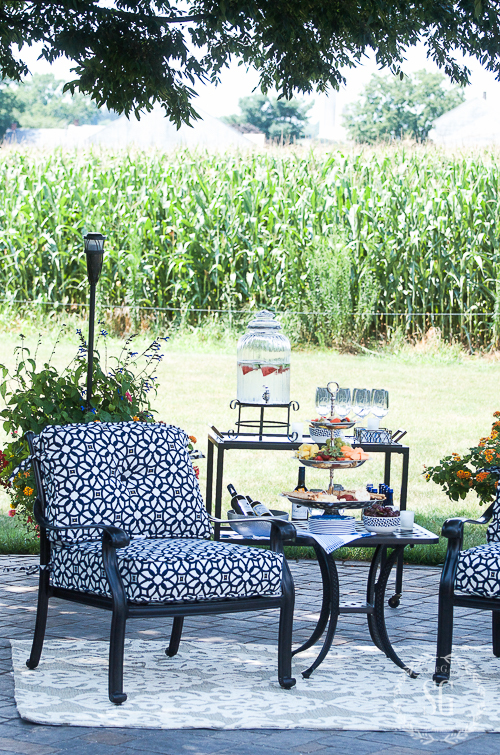 I especially love seeing the corn in the background. Heading to Lancaster County next week and can’t wait to see how high that corn is! 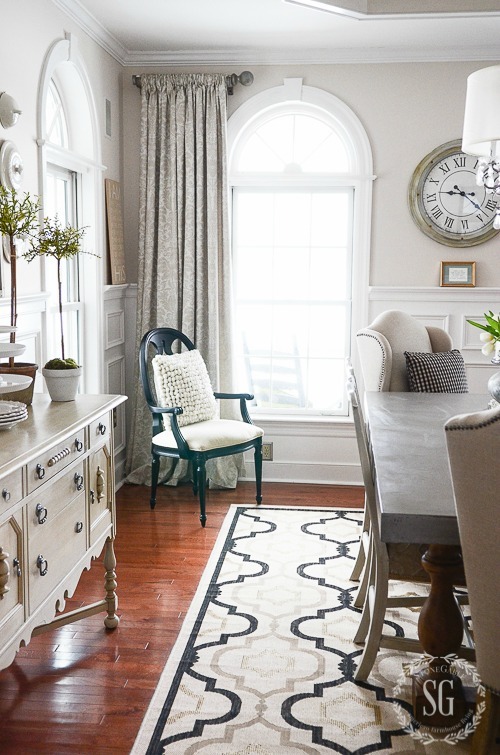 Since I am shopping for a rug to use in the front porch, I eagerly read this post! 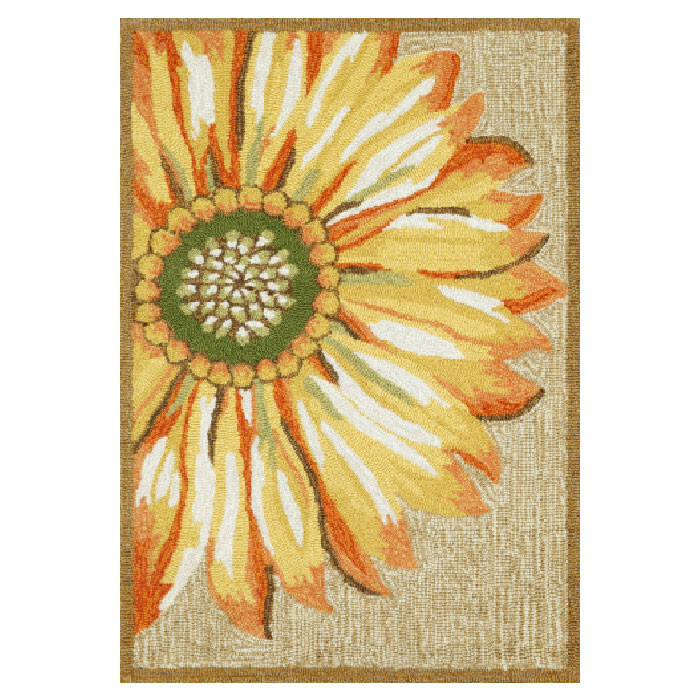 Hi, I love the Sunflower Rug, So Cheery! Also the Hand Hooked Couristan Rug, Love Greens and Blues! !..Keep Cool Everyone Today!! I love all the rugs you’ve chosen! Thanks for the tips! I loved your outdoor rug you have in your dining room under the table so much that I bought the same one! Ordered 2 runners in the same pattern. One for the kitchen and one for the dining room. They have held up great! Thanks for the inspiration Yvonne!! Your rug choices are fabulous, Yvonne! Thanks for all the great ideas and advice! Loved your suggestions. I have been looking online for some for my kitchen, not as many choices in Canada. I never thought of using a outdoor rug under my dining table. What a good idea! You had my attention as soon as it read the spring patio posts earlier. I was visiting my son and we immediately went shopping for an outdoor rug and some accent pieces for his front porch and back deck. The results are fabulous! I’m back to visit and had morning coffee On the back deck yesterday! It’s made a world of difference in the atmosphere! He continued the search for a small table in front and an outdoor rug on the back while I was gone. Fabulous and so simple, and inexpensive! Thank you for lighting the way! Love the Dobby flatware -and it looks like it’s on sale! one of these may be finding a a new home in my entry way. My front door opens right into the living room – no defined foyer area at all so I’m thinking a 5 x 7 like this could be my ” designated” entry way. My rug of choice in the sink area of my bathrooms is an outdoor rug. They are so sturdy, economical and easy to care for. As well as adding much more interest to the area than a typical bathroom rug. I never read one of your blogs that I do not get at least one great tip from it. Thanks so much for all the wonderful ideas and tips you share. You talked me into getting a couple now? Wow, thanks Yvonne! I never thought to use an outdoor rug indoors. I don’t know why that makes perfect sense! Love those rugs! Especially the gray one! Thanks for this post! You have shown us quite a beautiful collection of outdoor rugs! There are several that I could choose. Thanks for all of the great tips! I hope that you have a blessed and wonderful day!!! Thank you so very much for all of your wonderful insight. Just love your blog. Love your selection of outdoor rugs. I like your tip for using the rugs inside. 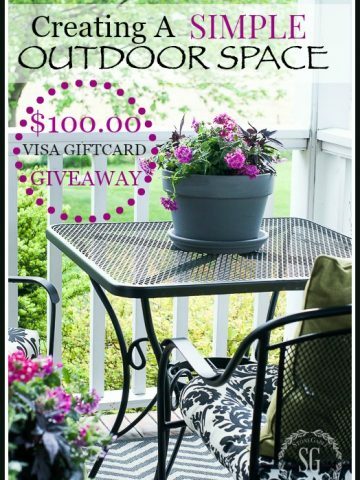 Have a good Thursday and enjoy your outdoor living space, Yvonne! My favorite outdoor rug is a smaller one that I have on my deck. I bought it at my local thrift store. There is a lovely group of ladies who make crafts and gift them to the store for retail. They make quilts, rugs, candles, knitted hats, scarves, & mittens, plus dish scrubbers and pot holders. I’ve purchased many of these items – the craftsmanship is excellent. The rug I chose is black and I just love it. I’ve gone back many times, looking for another by one particular woman (hers are the best) and hope to eventually buy one or more by her (the tags have the name of the weaver). By the way, when they make the candles, they gather ones donated to the store and items to pour the melted wax into. I’ve bought two of them – one is in a red metal camp mug and the other is in a Royal Victoria Fine Bone China footed dessert cup in the flowers and bows pattern and it is filled with a red scented candle…just beautiful! Thanks for all these wonderful tips. Love the idea of using an outdoor rug indoors! Good Morning, All! I adore these rugs. The difficult time is picking just one! A gorgeous day in northern PA! God is showing off His Splendor. Feeling grateful. I’m looking for kitchen rugs to replace mine. I need those with a non slip back since my floor is hardwood. I hope I have luck in finding just the right ones! Thanks for the suggestions! Tina, use a waffle mat under any rug for your kitchen. 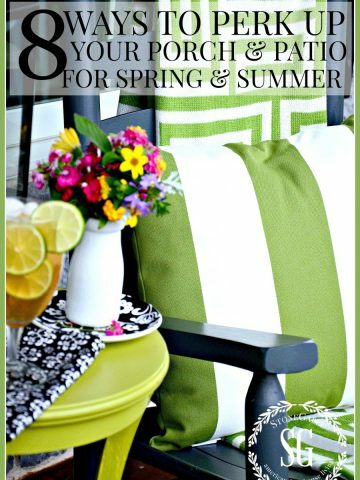 What a wonderful idea…..great ideas for using indoor/outdoor rugs…..
Pam, a dining pergola sounds amazing! I’m a big fan of outdoor rugs. I have quite a few of them. Since I live in Florida, I’m able to change them out for the seasons. 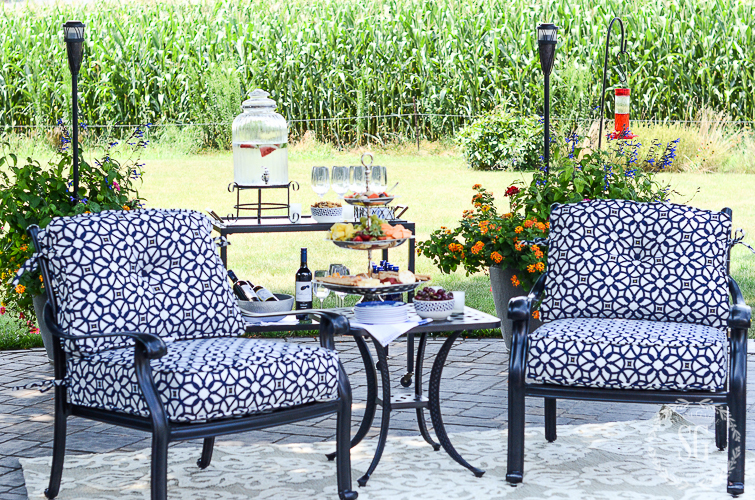 They look great on the Lanai with my outdoor furniture, and excessories. Love all of your rug selections!! They definitely add warmth and cozy up an area. I am adding a screened porch and will be looking for a rug so I was happy to see your informative blog this morning. Thanks for sharing, Yvonne!! 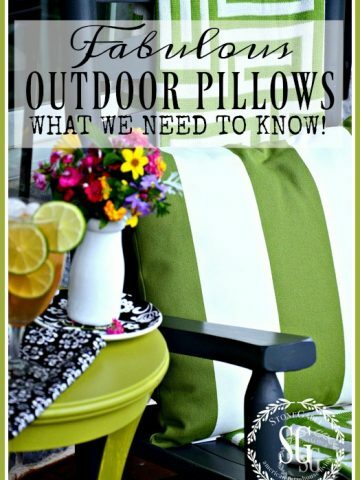 Great tips, I have one on our Lanai and LOVE it.